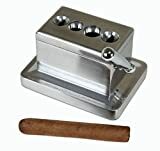 An absolute essential accessory for anyone who smokes cigars, our stainless steel cigar cutters offer durability with a vintage aesthetic, making it a great gift for seasoned cigar smokers. Offered in Guillotine, Double Guillotine and V-Cut. Please see available options to pick the right cutter. 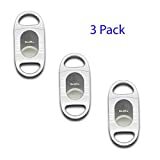 Featuring an extra sharp blade that will cut your cigar precisely up to 60 gauge, you never have to bite the end of a cigar again or struggle with a cheap, imitation cigar cutter. For optimal and precise results, apply pressure to cigar around area where you want to cut. Exercise caution as blades are sharp. 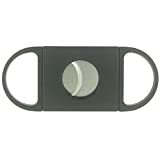 Small and compact, these cutters can be paired with other cigar accessories, stored in a pocket, wallet or any bag. 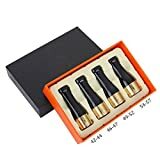 A must-have gift for cigar connoisseurs.